Best Design 2015 — Invisible Inc.
Invisible Inc. wins our 2015 award for Best Design. Below, Chris and Phil reflect on why its game rules, above all, make it one of our favorite games of the year. We'll be posting the rest of our awards and personal picks daily as we approach the end of the year, which we're collecting on our main GOTY page. Chris Thursten: I feel like I’ve written this line a dozen times already, but: Invisible, Inc. is the best designed game this year and if you disagree with me I will fight you. On a turn-based basis. In a room divided into a big grid with lots of cover. With slowly recharging, non-lethal weaponry. This is a game that not only combines the stealth sim, tactical strategy game and roguelike successfully, but does it in a way that solves a bunch of problems with all of them. To the stealth sim, it introduces completely transparent rules. You always know what your options are, what the likely results of your actions will be, and your choices are always mitigated by resources that you have complete control over. There’s no chance failure, and very little trial and error. You either learn to make all of these totally-fair systems dance, or you fail. Every little thing you take is a victory, and every last-ditch escape is a triumph. To the tactical strategy game, it introduces a one-sided power dynamic that creates drama and moments of heroism. You’re an intruder, here, a small group of operatives trying to find a gap in a mega-corporations vast physical and digital armour. Every little thing you take is a victory, and every last-ditch escape is a triumph. Firepower doesn’t mean very much, so it doesn’t suffer from the old XCOM problem of getting easier as you get further in. Finally, as a roguelike it dodges repetition by giving you a choice of agents and powers that substantially change the character of each new campaign. You don’t end up repeating early levels over and over in the hopes that you’ll get lucky because ‘getting lucky’ is never the point: learning is, developing the loadouts and strategies that you’re comfortable with and that you know how to use. Unlike XP or credits or items, ‘learning’ isn’t something you loot by chance. It’s something you’re always gaining, however you choose to play, and as such it’s always rewarding to do so. Phil Savage: Invisible, Inc. can feel brutal. It tempts you into tough situations, stoking your greed and then punishing you for it. Failure is omnipresent thing, and can be disastrous for your campaign. What makes Invisible, Inc. brilliant is that these failures are never random. It's a turn-based strategy in which your actions aren't defined by dice rolls. The difficulty isn't tied to chance, but decision making. Get into a tricky spot and, more often than not, it's possible to turn things around by thoroughly thinking through the current situation. 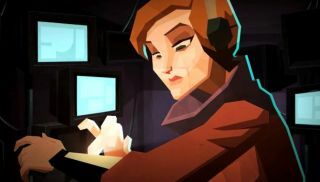 More than in XCOM, or similar games where safe plays are rewarded, Invisible, Inc. encouraged me to use my character's full breadth of abilities—finding interesting ways to escape the fine mess that I'd gotten myself into. It's a perfectly executed heist game: giving long odds and high stakes, but providing you the tools to subvert its hostile environments in your favour.